As you may remember from my post on the Spectrum Collections Atlantis Collection launch, I made a passing reference to Kris Keys, a fashion illustrator who had been hired to sketch portraits for guests. I also said "more on her later" - and this is me, staying true to my word. When I got home from the launch, I checked out Kris's portfolio on her website (and then her Instagram), and fell in love with the beauty of her work. The colours were wonderfully vibrant, and her personality shone through every piece. 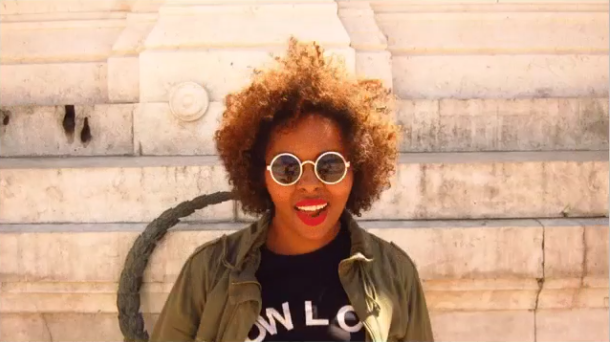 Kris's background peaked my interest - born in Memphis, Tennessee, she made the move to New York City, then settled in London, where she's been for four years. Her talent hasn't gone unnoticed, either, having been commissioned for exciting projects with big names such as NARS, a highly coveted make-up brand. 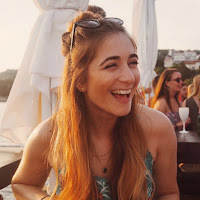 I didn't get chance to have a chat with her at the Spectrum event, so I emailed her to ask if she'd like to be interviewed by me for my humble blog. To my delight, she accepted, and here we are! 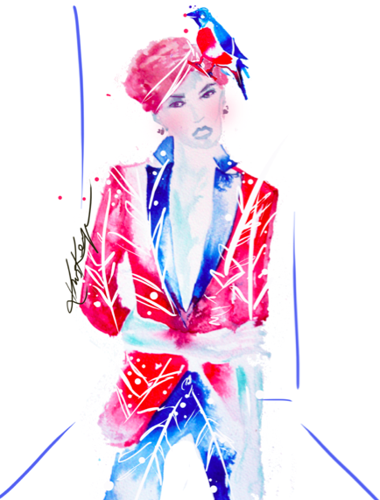 I'll be the first person to admit that prior to my interview with Kris, I really didn't know much about fashion illustration, apart from the fact you had to be good at art to do it (duh!). So it was incredibly interesting and informative to learn more about such an exciting career which, in a world where we like personal touches with a bit of an edge, will only become more and more in demand. 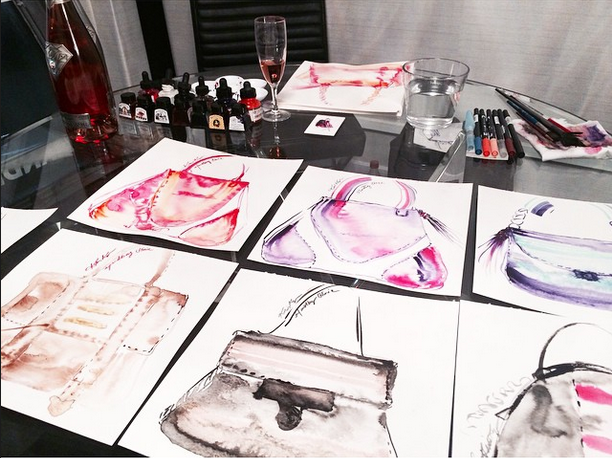 First things first: how did you become a fashion illustrator? I've been drawing all my life. I was introduced to fashion through my aunt who was a pattern maker and a design student when I was a little girl. I'd play with all her machines and fabrics. When I moved to New York in 2008, I took a course in fashion illustration from Steven Broadway (of prestigious design school, the Fashion Institute of Technology), and that's how it all started. Since then, I've worked for NARS Cosmetics, been mentioned on Vogue ITALIA.com... It's exciting what it can lead to, from product design, editorial, and even work for a fashion house. Do you come from a creative background at all? My aunt is the only creative one that I can think of. Everyone else in my family isn't very into art. My aunt's pattern cutting and illustration was definitely the driving force in pursuing a creative career. 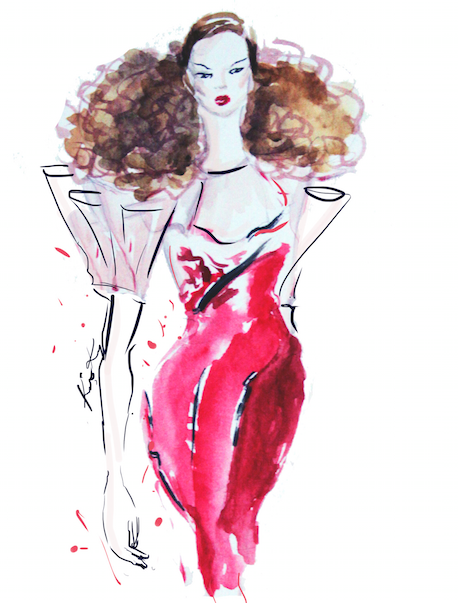 When would someone call upon a fashion illustrator? For all sorts of design requirements, for instance packaging, editorial (for illustrations alongside the story), if you were a fashion designer... You have to be both the illustrator and technical designer which includes flat sketches and ensures everything is correct before the garments go to the manufacturer . Also live illustrations, logos, website banners, book covers. I recently designed a cover for Healthy Living for Her from the Inside Out by Kayla McIntosh and Whitney Wilkins. Where do you draw your inspiration from? 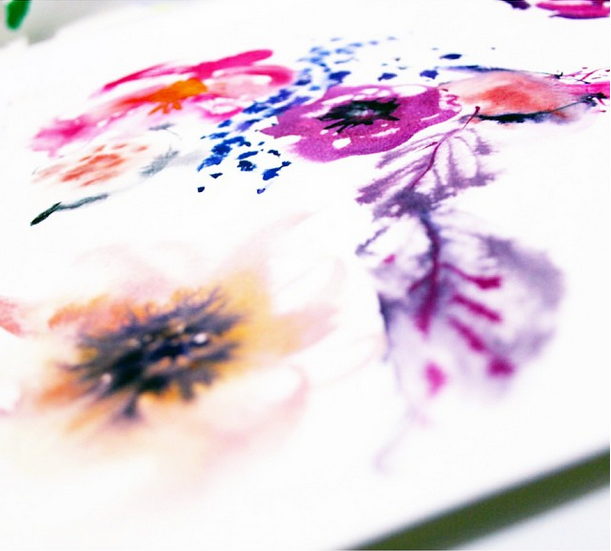 Do you tend to work from a mood board? I draw inspiration from everywhere - water, Japanese folding techniques ,nature, photography, people on the street, architecture, flowers, museums. I'm a big Pinterest fan, and like Tumblr, and I collect a lot of books and magazines. The thing that immediately struck me about your work was the intensity of colour - is this personal preference? I really love colour. Watercolour is the medium that stuck with me from the beginning, When I started out I used charcoal and acrylics too, but watercolour and Indian ink gives me the most vibrancy. During the illustrative process, how do you decide which aspect/s to focus on? Sometimes it's based on commissions, and sometimes it's me wanting to try out a new feature. I don't want my illustrations to focus on one subject. When I started out I wanted to capture the essence of a city girl - sometimes it's in the hair, face, clothes, the components of the woman which make the whole. The women in my illustrations are a mix of my background in Memphis and my experiences in New York and London. It's vibrant, gritty, and a little seductive at the same time. My illustrations lately are taking on more of an abstract form which allows it to be interpreted in many different ways. Out of curiosity, how long does it take you to create an illustration? It can range... It's usually 8-10 minutes for each illustration for live events. It's important at events to allow as many people as possible to have the chance to get their portrait painted. Sometimes it can take a few hours from start to finish if I edit on Photoshop and clean it up a little.... Sometimes long as days if I leave it and go back to it for revisions or for larger detailed paintings. For a client I'll try to finish quickly to make sure it's perfect in time for their deadlines. Where and when does inspiration hit? It's completely random. However, morning is where most of my inspiration comes from. I love the sunshine, so I like to get up early, around 6am/7am and there's a small bit of sun, before the clouds mask the sunlight. If I can get up and paint when it's sunny, that's even better. As I've gotten older, I've become more of a morning person. What material/s do you prefer to work with? It has to be Arches watercolour paper. I like doing large illustrations in general, but I need lots of space, which is a challenge in London. I've started doing Japanese Shodo, which is a form of calligraphy from the Japanese language. It includes dipping the brush in the ink and making big movements across the page. The movement is a form of art in itself and a form of meditation. It reminds me of the work by Yves Klein and the concept of performance art that I really like. What's been your favourite project, and why? Doing live illustrations. They open me up to a new world, and I meet new people doing it. Also my collaboration with NARS at Selfridges - I did a tour at their London and Manchester, and Birmingham stores. They were makeovers for the whole week and if you scheduled a makeover, you had a face chart sketched by me, too. I coloured the illustrations with the NARS products. It was my first time drawing without watercolour and ink, and it was very fun. 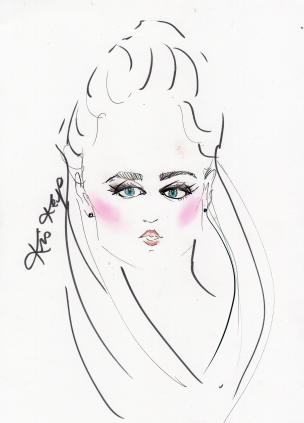 Kris's work with NARS x Selfridges "The Beauty Project"
What's your favourite part of illustration - the freedom, the chance to travel, the craft itself? All of it! But freedom especially. I've worked for corporations before, and you're always working for that brand, so it's the same type of work every day. Working with different clients means I get to try out different things with different subjects. And it also gives me the chance to learn and experience different things. What are the main cultural/artistic differences between New York and London? London helped me to hone in on what I wanted to do, New York is so busy with so much to do, which means it's difficult to stay disciplined. Moving to London was great, as it's an entirely new environment - very fresh - and I found inspiration in everything. It's easy to find new subjects to illustrate when you move away from what you know. The slower pace meant I had time to find my style, and I'd illustrate people for hours on end. It's changed over time, I've been in London for a while now, but the immediate move gave me space to create. What's been your breakthrough moment? Probably when I started illustrating during fashion week. My first season and show was SS 2012 for Caroline Charles at London Fashion Week. The first time I ever illustrated at a show. After that, when I started attending shows more often and illustrating for them, I'd publish it on Tumblr. It can help to promote my work, and inspire others. The same goes for Instagram. 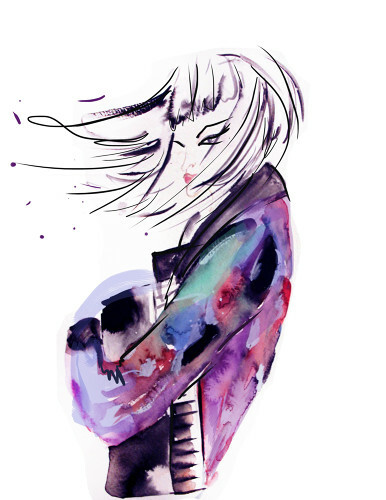 What advice do you have for anyone who wishes to get into fashion illustration? I'd say to illustrate day in day out until you find your style. Style is absolutely key because there are a lot of illustrators out there. Keep going until you find a distinct style. Find your niche, your aesthetic. Don't be afraid to do free work and volunteer to get your name out there. Also, try and contact companies to see if they're interested in a collaboration. I've started doing textile and print design. In the coming weeks I'll be uploading textiles to my website. So this will be printing onto fabrics for garments... I'm taking an intense fashion design course at the moment focusing on womenswear and print design. The design is painted on paper first, then transferred onto the fabric digitally. I'm also taking part in the 100 day challenge on Instagram - you do a painting every day, or something else creative everyday. It's great because it encourages you to be disciplined and focused. Plus, I can't just skip a day because people are following me and they notice! A big thank you to Kris Keys for allowing me to interview her! For more information on Kris and her work, visit her website www.bykriskeys.com.